South Africa has writers. 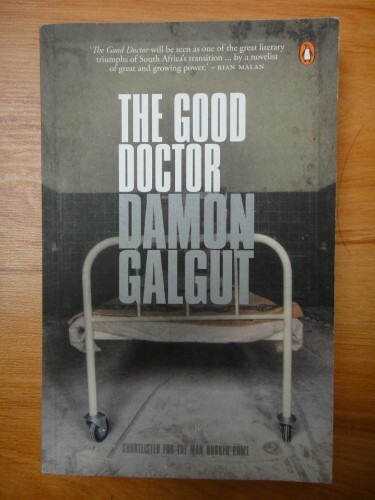 Some excellent ones in fact, like Damon Galgut. He’s been shortlisted for the Booker Prize twice, for The Good Doctor and In A Strange Room, as well as raking in local awards. As of his 2014 release of Arctic Summer, his writing career continues. Yes: he’s alive. Quite strangely for me at present, the author I’m reading isn’t dead. I’ve also had the pleasure of meeting him. Ironically, The Good Doctor contains the line: “The moment you put two people together in a room, politics enters in,” which may have been prophetic since I now write this review with the cognizance that Damon might actually read it. The Good Doctor is Lawrence Waters, a young doctor idealistic to the point of being juvenile. Lawrence arrives at a run-down hospital with the mission of helping people. Run-down is a euphemism: the entire hospital is manned by 7 people in the middle of nowhere, is filthy and dilapidated and has barely the supplies or the patients to justify it’s existence. This only increases Lawrence’s conviction to regenerate the place. But Lawrence’s headstrong naivety is seen as a nuisance by his peers, and he clashes heads, especially with the book’s cynical narrator Frank, the only other full-time doctor at the hospital. I could say that the book is about Lawrence’s struggle to save something that doesn’t want to be saved. Or perhaps it’s about Frank dealing with this unwelcome disruptive influence in his life. Or perhaps it’s a reflection of the childishly excessive (but half-blind) optimism of the new South Africa. The book is multi-faceted and presents much without overly steering the reader’s judgement. The narrative style is loose and grounded, so entwined with reality that the question of whether or not it’s fiction becomes inconsequential. The book isn’t populated with characters, but with real people. They’re subtle but strongly realized; ordinary, but alive. The stark realism I’ve seen in other South African writers, such as Coetzee, but Galgut’s is markedly different. It’s dry and gritty, interspersed with the unclean roughness of real life. There are unrequited feelings, conversations that go nowhere, narrative threads that vanish as mysteriously as they arise in more fantastic stories. Things change, the plot develops, webs of intrigue form, but The Good Doctor exists so separately from the space of narrative convention that it seems to parody everything an ordinary novel stands for. And the heart of this anti-novel is human tragedy. Of the subtle vagaries of life and the isolation of being in a far-away place forgotten by the rest of the world. It’s good, let me say that much; one of the better novels I’ve read this year. It entertains in the way that a traditional novel is meant to but this novel isn’t traditional.